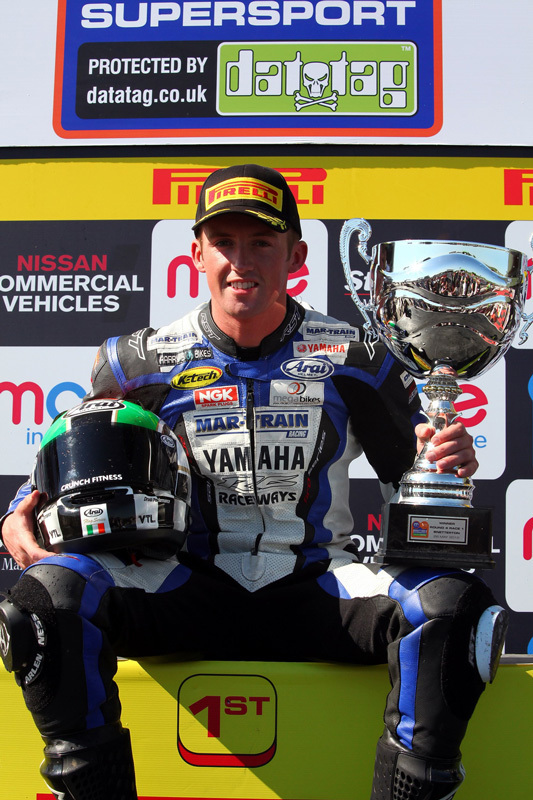 Mar-Train Yamaha’s Jack Kennedy sensationally scored his first double win of the Motorpoint British Supersport Championship season following an intense four-way scrap on the final lap of the feature race at Snetterton to beat off the Smiths (Gloucester) Racing Triumphs of Billy McConnell and Glen Richards. 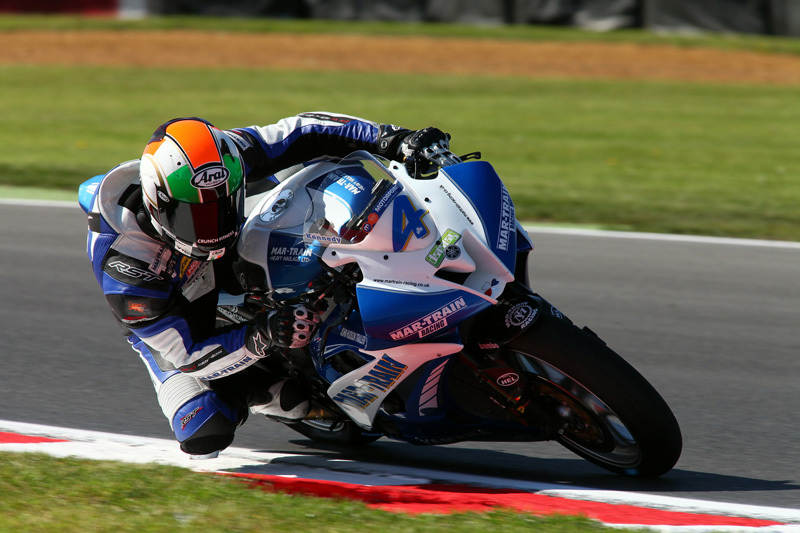 Kennedy had been victorious in the Sprint race at Snetterton following a battle with pole-sitter Glen Richards and Gearlink Kawasaki’s Ben Wilson. Richards had taken the early advantage but Kennedy and Wilson fought for the podium positions during the early stages of the race before Kennedy regained the lead and held on to claim the win from rival Richards with Wilson dropping to third. Luke Mossey was closing in on the second Smiths (Gloucester) Racing Triumph but had to settle for fourth with Billy McConnell completing the top five. The Feature race was an intense battle for supremacy as Wilson took the lead on the first lap from the Smiths (Gloucester) Racing Triumphs of Richards and Mossey. Richards then stormed into the lead to push Wilson to second with Mossey running third at his home round before waiting until the lap later to move ahead of his Gearlink Kawasaki rival at Brundle. Kennedy then edged ahead into Riches before Richards repaid the move before the Nissan GTR safety car was deployed when Wilson, Jimmy Hill and Luke Jones crashed out at Nelson. When the race resumed Richards continued to hold the lead, however Seton Tuning Yamaha’s Sam Warren was storming through the order to move up to fourth. Warren then moved third and the top three changed again as Warren moved second on the penultimate lap as a hard-charging McConnell moved third to relegate Kennedy to fourth. Mossey then crashed out of the leading pack at Nelson, ending his hopes of a strong result at his home race. On the final lap the positions changed throughout the 2.99-miles; Richards had held the lead across the line but Warren hit the front into Riches for the final time. The Smiths (Gloucester) Racing Triumph rider wasn’t giving up without a fight to take the position back into the next corner of Montreal as team-mate McConnell moved to second around the outside of Warren. The leading four then battled on the infield section as McConnell snatched the lead into Oggies before Richards regained the advantage into Coram as his team-mate ran wide. McConnell made a final attack into Murrays to take the lead from Richards, Warren and Kennedy, but the Mar-Train Yamaha got the drive out of the final corner to win the drag to the line. McConnell claimed second from Richards as Warren just missed out in fourth.